Brown rice is the healthiest! Is conventional wisdom true?? My happy healthy medium is Parboiled! September is the celebrated as the National Rice month. There are thousands of varieties of Rice and is enjoyed as a part of the staple diet by millions of people across the world. I wanted to share what I learned about White rice vs. brown rice and above all pros and cons of both of them. Brown rice or the un-milled rice is the whole grain rice. When only the outermost layer of a grain of rice (the husk or hull) is removed, brown rice is produced. It has a mild, nutty flavor and is chewier and more nutritious than white rice. One cup of cooked brown rice contains 84 mg of magnesium compared to 19 mg in white rice. How is White rice made? 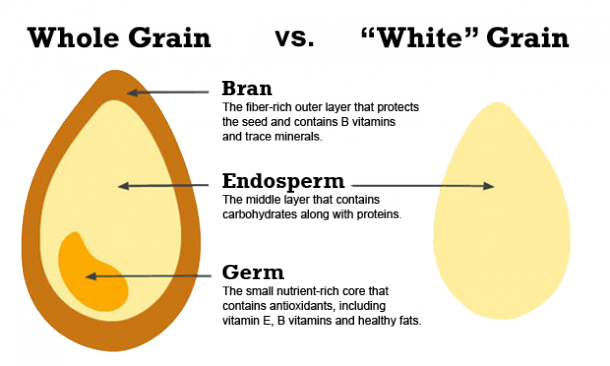 It is produced when the next layers underneath the husk – the bran and the germ are removed leaving mostly the starchy endosperm. Several vitamins and dietary minerals are lost in this and the subsequent polishing process like in making of long grain Basmati rice. Hence many manufacturers fortify it with vitamins and minerals to make up for the lost ones. One mineral not added back into white rice is magnesium. After reading this you might say, I am switching to Brown rice today. But wait there is more to learn before you switch. Have you heard about arsenic in rice? Arsenic is an element found in nature but is a cause of concern these days because the levels of arsenic found in our soil and water is going up. It has been released into the environment through the use of excess pesticides. And rice tends to absorb arsenic more readily than many other plants. Arsenic accumulates in the grains outer layers so brown rice tends to have more arsenic in it. Brown rice has 80 % more arsenic on average than white rice of the same type. Brown rice has more nutrients though, so you shouldn’t switch entirely to white rice. All types of rice made in US particularly in Arkansas, Louisiana and Texas had the highest levels of arsenic in the tests conducted by Consumer reports. White Basmati rice from California and India had on average half of arsenic amount compared to most other types of rice. Tip to reduce arsenic in your rice is what my mom always did so I do it too, not knowing the reason but on autopilot: One can cut the exposure to arsenic in any type of rice by rinsing raw rice thoroughly before cooking, using a ratio of 6 cups water to 1 cup rice and draining the excess water afterward. Brown rice: Pros: Highly nutritious Cons: Comes with a risk of high arsenic depending on where it was grown and you have to develop your taste buds for liking it. After learning of the pros and cons, I hit a middle ground with healthy Parboiled rice. What exactly is Parboiled rice and how is it made? Parboiled rice also known as converted rice is steamed under pressure or partially boiled prior to removing of the hull and bran The three steps of parboiling include soaking, steaming and drying, and then removing the husk of the rice. This process enhances the nutrition density by driving nutrients from the bran to the endosperm, making it about 80% nutritionally similar to brown rice. It is a better source of fiber, B vitamins and magnesium than regular white rice. Parboiled rice might sound like it’s precooked, but it is not. It is just processed quite differently from other types of rice. It is more nutritious: Parboiled rice has double the fiber than you get from cooked white rice. It is an excellent source of niacin, thiamine and magnesium and a moderate source of protein, iron and zinc. It has a low glycemic score of 38, even lower then brown rice which has a score of 47 and White rice which is 89 notes Harvard Health publications. A low glycemic score indicates that the carbohydrates in parboiled rice do not cause a large spike in blood sugar. Cons: It is 20% less nutritious compared to brown rice. Shopping guide: Given rice grown in California and India has low amounts of arsenic compared to those grown in Southern states of US, I prefer to buy my parboiled rice from Indian grocery store (Laxmi is personal favorite). Ponni boiled is similar in processing to Parboiled but smaller grain. If you like long grain rice go for Parboiled Basmati. P.S. A tip to add protein to your daily carbs. I mix 1/3rd cup of Quinoa to 1 cup of Rice, rinse it thoroughly, soak it for 30 mins before cooking. Does not change the taste and works like a charm even with my tiny picky eaters! Thank you for this thoughtful and well-researched article on rice. I knew that arsenic in rice was a risk but I wasn’t clear which type of rice had higher levels and that you could simply rinse the rice to reduce the arsenic level. I had never heard of parboiled rice and it really does sound like the perfect choice. Also, it’s great to know that parboiled rice has a lower glycemic value. It’s all good! Thanks! Thank you, Carol. Really appreciate you noticing all the research I pulled in this article! Hope to spread this post so more people can make the right choice for their family!